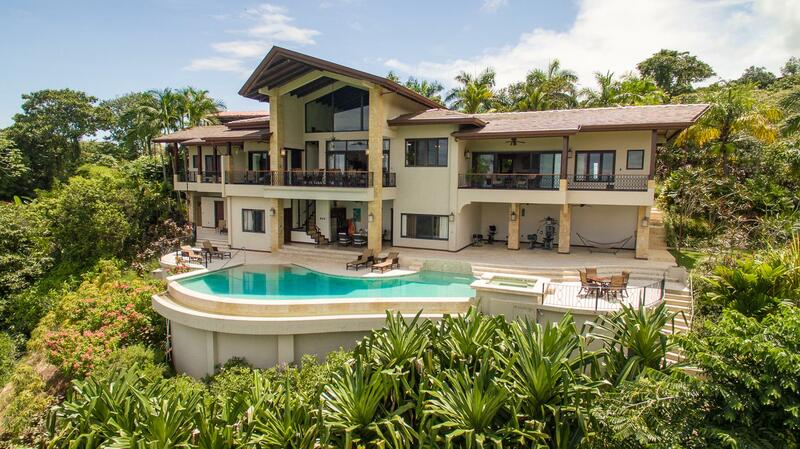 One of the rare hilltop residential properties in Manuel Antonio is being offered for the first time on the market. The stunning Casa Aguila estate offers almost 2 acres of prime ridge top property within a gated community, located in the heart of M.A. The approach to the house is via a concreted driveway which forks to the main house on the southern section of the ridge and the guest house on the northern section of the ridge. The main house measures approx 3,000 ft2 (interior space) and is a two level, modern (glass and steel) structure with an organic shaped roof line designed to keep the sun off the facade and rain off the generous terraces. The main/ground level features the kitchen, dining terrace, great room and 2 bedrooms and 2 baths. Also on this level is the pool and some beautiful green space. The upper level houses the master bedroom which features very generous spaces, its own terraces, walk-in closet and dual views of the ocean/sunset and towering mountain range/sunrise. The property also has great infrastructure with plenty of storage and mechanical space and is complemented by a large 2 stall garage with an unfinished area above that could become a workshop or a caretaker\'s apartment. The main house is full of light, breezy (and air-conditioned), great for hosting and allows one to enjoy the area\'s natural beauty due to its design concept and visually expansive nature.